On November 27, 2018, the GEO BON Marine Biodiversity Observing Network (MBON) signed a memorandum of Understanding (MOU) with the Atlantic International Research Centre (AIR Centre) and the Azores Regional Fund for Science and Technology (FRCT) for mutual recognition and a strategic alliance to establish a sustainable collaboration. The government of the Azores is leading an effort supported by the government of Portugal, Spain, and others, and by agencies of the European Community, to establish the AIR Centre. The AIR Centre is to be house in the Azores (see https://www.aircentre.org/). Ceremony after signing the GEO BON MBON MOU with the AIR Centre and FRCT, in Las Palmas de Gran Canaria (Spain) on 27 November, 2018. Joining hands from left to right are: Bruno Pacheco (President of the FRCT), Antonio Sarmento (at that time Chair of the AIR Centre Executive Committee), Isabel Sousa Pinto (University of Porto and MBON co-Chair), Manuel Heitor (Portugal Minister of Science, Technology and Higher Education), and Frank Muller-Karger (University of South Florida and MBON co-Chair). The MOU seeks to strengthen the scientific collaboration on practical applications of biodiversity research jointly with GEO BON MBON. 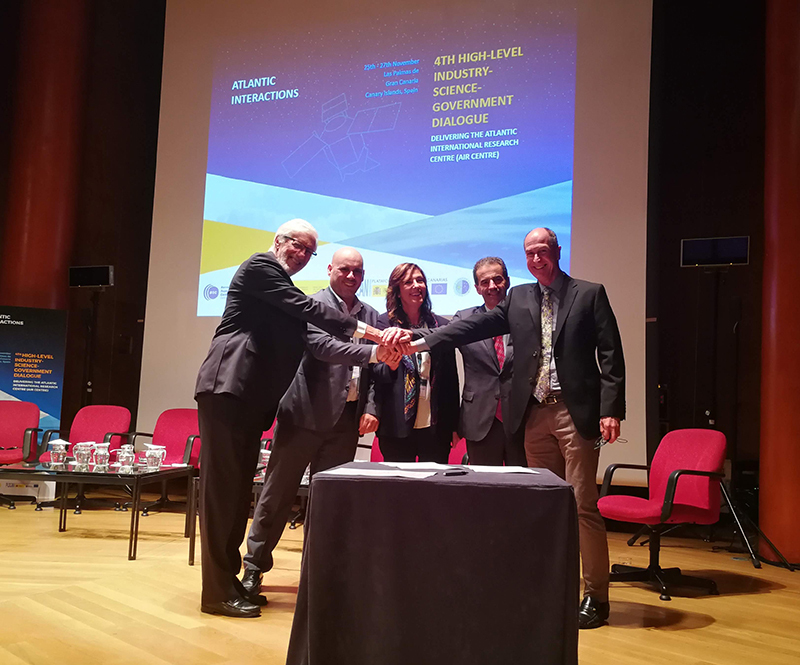 The MOU was signed by the co-chairs of GEO BON MBON (Mark Costello, Isabel Sousa Pinto, and Frank Muller-Karger), as well as Bruno Pacheco (President of the FRCT), and Antonio Sarmento (at that time Chair of the AIR Centre Executive Committee). MBON also serves as the biodiversity arm of GEO Blue Planet, a partner in the dialogue with the AIR Centre. Jose Moutinho, of Portugal, has been instrumental in facilitating these conversations and setting the stage for a collaboration. The MOU establishes a collaboration to identify areas of mutual scientific and technological interests related to biodiversity that address both regional priorities and global challenges. The MOU also expresses a desire to discuss the feasibility of hosting MBON Secretariat in the Azores in support of the MBON Steering Group co-Chairs and to evolve a governance framework for MBON. The practical aspects of the collaboration focus on the organization of joint workshops, user engagement activities, and the dissemination of scientific knowledge to the general public, policy makers and media.